Episode 20: "The Noble Art of Murder"
In Brussels, Belgium, Barry Chan participates in a French sabot boxing match. After Barry knocks out his opponent, Henri Bergette, it is announced that the downed fighter is dead. The police are called and Inspector Pierre Renal, an old friend of Charlie Chan, arrives. Later, with Chan present, Renal begins the investigation. Soon, Madame Dubois and her daughter, Henri's fiancé, Odette, arrive at the gym, joining Georges Larue, Madame Dubois' brother and owner of the gym. George comforts his niece, and Inspector Renal allows Barry to leave with his father, adding that he must remain in Brussells until the investigation is complete. At a street café, Barry tells his father his belief that Henri did not die as a result of their match. Barry had, after returning to the gym after his shower, had noticed that Henri’s body was in a different location than where he had left him following his being knocked out. Barry speculates that someone must have murdered Henri during his absence. When Chan asks if there had been any witnesses, Barry notes that a group of tourists had visited the gym and had witnessed the sabot match. Chan and Barry locate the office of the tour guide, Jacques Flaubert. While he is being questioned, Mary Warner, one of the group of tourists who had taken a number of photographs during Barry's match at the gym, suddenly arrives for her planned dinner date with Flaubert. Among her developed photographs, Chan and Barry find a number of them showing his sabot match with Henri. Later hat night, Barry slips into the gym seeking clues to clear himself by returning to the scene of the crime. Caught inside the gym by Inspector Larue and Georges, thus bringing even more suspicion on himself, Barry is arrested. 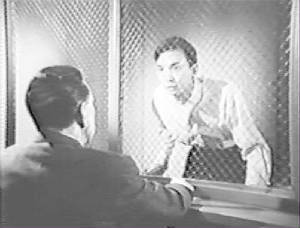 Visiting Barry at the city jail, Chan tells his son that Henri died of a skull fracture. Barry thinks that Inspector Renal is more interested in helping Odette than anything else in this case as he had once been engaged to her. Barry admits to Chan that, in a moment of anger during their match, he had made what could haven been deemed a threat against Henri, something that had been noted by three witnesses: Georges, Jacques Flaubert, and Mary Warner. When asked by his father if there was any friction between Georges and Henri, Barry mentions the fact that Georges had not wanted his niece to marry Henri, but were on decent terms otherwise. Inspector Renal informs Chan that Barry may leave the jail as Chan has posted adequate bail. Later, Chan and Barry visit Odette and her mother. When asked about her brother Georges' anger toward Henri, Madame Dubois recounts how she had given her daughters' fiancé a large dowry. Henri had expressed his desire to use the money to invest in a gym in Antwerp, but while he was on his way there, had been robbed of the money. Henri, who had wanted to use his sister's money to invest in his own gym. Back at their hotel room, Chan and Barry analyze the series of pictures taken by Mary Warner at the sabot match, as well as a photo taken by a newspaper photographer later. Chan notes that, besides the fact that Henri's body had obviously moved from the ring to another location in the gym, a set if Indian clubs on the wall had also been altered from one picture to the later newspaper image. From this evidence, Charlie Chan informs Barry that he has not only determined the murder weapon but the identity of the murderer as well. Returning to the gym, Chan and Barry, with Georges in tow, search for the missing murder weapon. In Henri's locker, Chan finds a gambling receipt from a Monte Carlo casino. It seems that Henri had probably gambled away Madame Dubois' money. Next, finding the Indian club, Chan tells Barry to contact Inspector Renal, as the fingerprints will prove the identity of the killer. Georges makes a desperate move, but he is stopped by Barry who uses sabot moves to subdue him. Madame Dubois and Odette now arrive with Inspector Renal at the request of Charlie Chan. Chan reveals that although Georges was involved, it was actually his sister, Madame Dubois who had clubbed Henri to death, feeling him to be unworthy of her daughter, Odette. After Barry had hurried to the shower after knocking out Henri, Georges, the referee of the match, announced that Henri was dead. With the gym hurriedly cleared of visitors, Madame Dubois attacked Henri from behind as he revived and stumbled from the ring. No words can express adequate sympathy for loss of a loved one. Self-reproach does not solve problems. Old saying: "Words in jest often lead to misunderstanding." Impatience sometimes is like large stone in pants - weight can trip you up.